You're IT Cycleology Bike & Ski! Three questions with Matt & Joyce Baldwin, owners of Cycleology Bike & Ski. My Wife and I started Cycleology Bike & Ski, because we love the outdoors and small local town shop feel. Skiing and biking are two of our greatest passions and a large part of both our families lives, past and present. We felt there was a void in the area for a smaller mom & pop type shop where everyone comes in each year to get their gear and we remember you and your family and what equipment you have and what you like and don't like. We love when people from the community bump into friends they haven't seen in a while at the shop, it really gives it that great local community feel. Our best selling service would definitely be our seasonal ski rental equipment. Everyone in town and the surrounding towns has been so excited to have a local shop with daily & season ski rentals. Fairfield has a large number of families who ski and it's great to see how supportive and happy they all have been to see us grow this part of our business. We currently employ seven staff members. Five of our employees are local high school students from Fairfield. For many of them, this has been their first experience having a job and it has been fascinating watching them grow over the years and train up and coming staff new to the shop. We love when customers walk in and know the staff, from years past or because they are neighbors or friends. 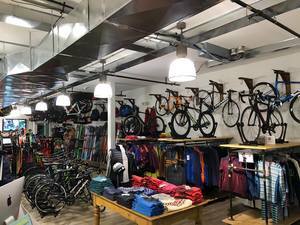 Cycleology Bike & Ski is located at 1 Sasco Hill Road in Fairfield. Visit them online here. Cycleology Bike & Ski tags Candlewood Coffee!